If you guessed Richard Harmon, aka John Murphy, you are correct. 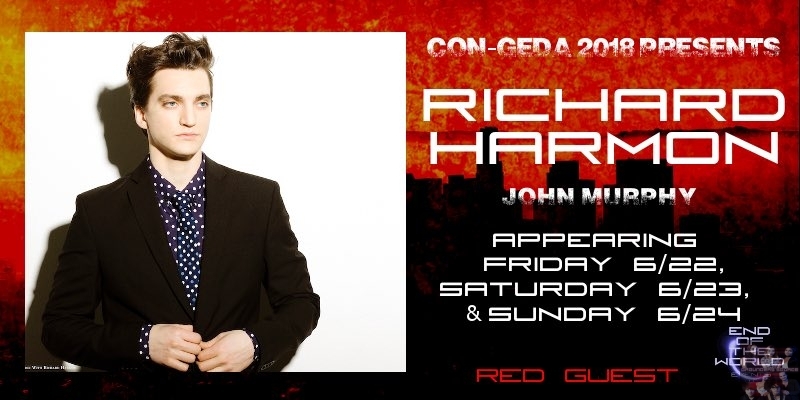 Richard will be at Con-Geda all weekend long to hang out with the fans, give autographs, meet and greets, photo ops, panels, and so much more. He will be joining along with Lindsey, Eli, Nadia, and one other unannounced guest at the June 22nd-24th convention. Richard, like Lindsey and Eli, will be a “Red” guest, and you can see his official announcement below. Tickets for passes, autographs, meet and greets, photo ops, and extras will go on sale this Friday, October 27th. Con-Geda will be held at Crowne Plaza LAX in Los Angeles, CA, and guests attending can receive an exclusive room discount by going to the End Of The World Events link. There is still one more The 100 guest that has yet to be announced, so be sure to check back to see who they are!